but some Intel drives do not follow that. added in a SAUCE patch, changed that from (1<<8) to (1<<15). With this fix, both drives can be seen. verified by the bug reporter. I bought a new Thinkpad X1 Extreme, and had it come with two SSDs, one 256G and the other 512G with the intention of keeping the windows on the 256G disk and using the 512G for linux. When dealing with the installer, it only ever saw one of the SSDs. I did manged to get bionic installed on the 512, but on boot, sometimes it doesn't find the 512G disk and I just get a blank screen. After a hard power-off, and reboot, it drops into the grub selector, and choosing linux, it failed again, but this time dropped into a VT. If a device provides an NQN it is expected to be globally unique. check so we don't print a warning when the quirk is enabled. 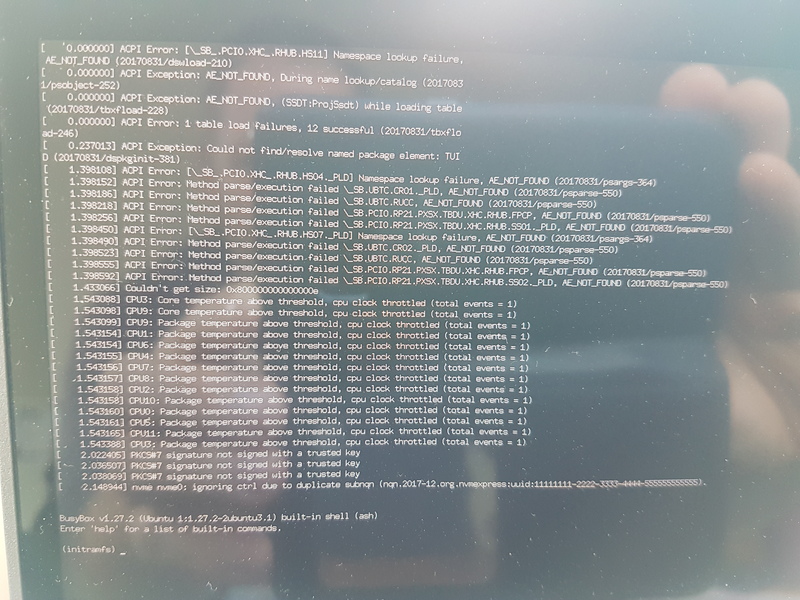 Will you ever be able to boot into your 512G disk? If you can, please try the test kernel in http://172.104.124.10/lp1811755/. Otherwise I'm afraid you need a new installer image with a test kernel. linux-image-4.15.0-43-generic (version 4.15.0-43.46) is present and installed. got the packages installed in the end, and so far has booted every time. Will this fix make its way back into the bionic-updates? Yes, the fix will be included in the next kernel SRU, bionic-proposed kernel will be available next week and target to be released to bionic-updates on Feb 25. It seems my install was missing the linux-generic package. After installing that I was able to get linux-generic 4.15.0.46.48 from bionic-proposed. Installing this removed the windows boot option from my grub config. Rebooting 12 times, 10 times were good, twice I got dumped into initramfs. Photo attached. Would it be possible for you to test mainline kernel ? It probably requires more commits to be backported. But first let's make sure it's fully fixed in mainline kernel. Final reminder to please test the kernel above to ensure it fixes the problem for which this bug was filed. Thanks in advance! > fully fixed in mainline kernel. I talked to Kai-Heng about this issue and he agrees that although it's not completely fixed by the patches applied they don't introduce further regressions. Based on that, we will proceed with Bionic and Cosmic kernels promotion to -updates. Follow up fixes can be submitted for a future kernel SRU. Please note that once the kernel packages are promoted to -updates, this bug report will be set as 'Fix Released'. When follow up fixes for this issue are identified, please open a new bug report and submit new patches with the new BugLink. nvme nvme1: ignoring ctrl due to duplicate subnqn (nqn.2017-12.org.nvmexpress:uuid:11111111-2222-3333-4444-555555555555).